We carry a huge selection of commercial kitchen equipment from all the top brands for your shopping convenience. You'll find food warmers, grills and ranges, ice making and refrigeration products as well as commercial scales. Check back often as we add more and more outstanding commercial kitchen equipment products.All of our products are from the highest quality and we only trade the top brands to ensure you get the best items on the market. Our discount prices cannot be beaten and we have compiled a huge inventory in order for you to find all the products you need at once place, and without breaking the bank. Regardless of what kind of commercial kitchen equipment you require to get the job done, you need not look further, as our selection is certain to satisfy any need. 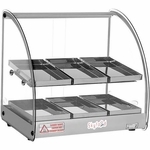 We have commercial food warmers available at low prices. We have commercial ovens available at low prices. We have commercial dishwashers available at low prices. We have commercial fryers available at low prices. We have commercial slicers available at low prices. We have commercial graters available at low prices. We have commercial cutters available at low prices. We have commercial shredders available at low prices. We have commercial choppers available at low prices. We have commercial wedgers available at low prices. We have commercial crepe makers available at low prices.